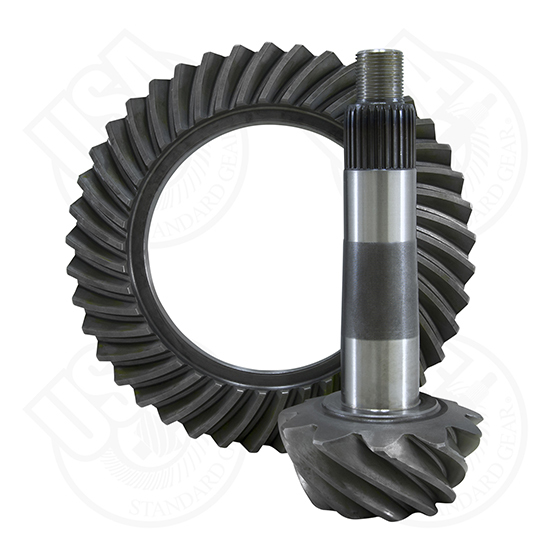 USA Standard ring & pinion sets are designed to provide a quality and quiet gear set for OEM replacement. USA Standard uses rigorous in-house quality testing and inspections to ensure products pass dimensional, material and fitment testing. USA Standard gears come in OE and aftermarket ratios, providing a wide variety of product to meet the needs of most any installation: from 1948 to present popular vehicle models. USA Standard gears are designed to exceed OEM specification while providing an affordable drivetrain solution. All USA Standard Ring and Pinion Gear Sets come with a standard one year warranty against manufacturing defects. Gears available in a wide range of fitments, ratios and applications.